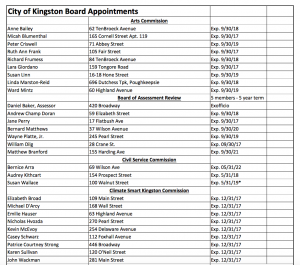 A Helpful Guide to the City of Kingston 2017 Primary Elections. The 2017 primary election will occur on Tuesday, September 12th. The polls are open from noon – 9:00 pm. We know that primary elections can be confusing, and that’s why we created a guide intended to help City of Kingston residents successfully vote for their candidate tomorrow. Please be in touch if you notice any errors or to make suggestions in the comment section. The best of luck to all candidates. Get out and vote Kingston citizens! Can I vote in in the City of Kingston 2017 primary elections? In a closed primary a registered voter may vote only in the election for the party with which that voter is affiliated. For example a voter registered as Democratic can vote only in the Democratic primary and a Republican can vote only in the Republican primary. How can I find what district or ward I live in in the City of Kingston? What does it mean if someone is listed on the ballot? When a candidate’s name is listed on the ballot, it means that they are in an actual primary (such as in the Kingston Common Council race in Ward 8). The other ward races are OTB primaries, where only endorsed candidates are listed. The others must be written in. An “Opportunity to Ballot” (or write-in) means voters affiliated with the party that is on the ballot are free to write any individual’s name in. For instance, if you are a Republican and you have the option to write-in a candidate in your ward or district, you may do so instead of voting for the listed candidate. An opportunity to ballot is the result of petitioning within an election district and if valid petitions are submitted with enough signatures, this opens the ballot for a write-in. Where can I find information about the party’s in this year’s City of Kingston primary race? The Ulster County Conservative party can be found on FACEBOOK. The Ulster County Democrats can be found HERE. The City of Kingston Democrats can be found HERE. Not to be confused with the “Independent” party, the Ulster County Independence party can be found on FACEBOOK for more information. The Ulster County Republican party’s website can be found HERE. 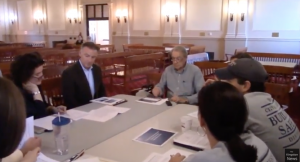 Recently we learned of an inquiry made by the City of Kingston Republican Committee Chair and general practice attorney, Joesph Ingarra. Apparently, he took it upon himself to write to the state Attorney General’s (AG) office, requesting that they investigate KingstonCitizens.org as a Political Action Committee (PAC). He placed his request into a press release sent to several local news outlets to “investigate and report”. Mr. Ingarra neglected to take the opportunity to reach out to us to clarify his concerns prior to his request to the AG. As a member of the legal profession, one would expect that he would understand the difference between a grass roots group and a PAC.